Epson est la première société a développer un microprocesseur 8 bits flexible en utilisant un film plastique TFT (Thin Film Transistors), une technologie similaire a celle utilisée dans les écrans plats. Cette technique permet au microprocesseur d'Epson de consommer 70% d'électricité de moins que les processeurs traditionnels en silicium. Les radiations électro-magnétiques sont aussi réduites. Epson croit fermement que cela va leur donner un avantage dans l’électronique mobile de demain, mais il semble peu probable que cette technologie soit un danger pour les puces en silicium dans le court terme. Un microprocesseur flexible pourrait permettre de faire de nouveaux designs et d’avoir des appareils plus résistants aux chocs. Cela irait très bien avec le » métal plastique » dont nous avons parle en août 2004 (en anglais). Seiko Epson Corp. (« Epson ») has announced that it has developed the world’s first*1 flexible 8-bit asynchronous microprocessor using low-temperature polysilicon thin-film transistors (LTPS-TFTs) on a plastic substrate. With energy consumption reduced by 70% compared to the synchronous microprocessors now in everyday use, Epson is now researching potential applications for its invention. The results of Epson’s research were announced at ISSCC2005, the International Solid-State Circuit Conference, held earlier this month in San Francisco in the United States. The combination of Epson’s original SUFTLA*2 technology, LTPS-TFTs technology, and asynchronous circuit design technology has made it possible for Epson to create stable displays that are large in size, and that use substrates that are both flexible and variable in shape. 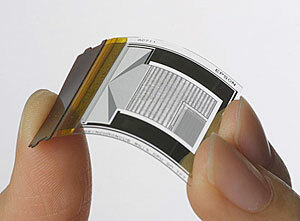 SUFTLA is an Epson developed technique that makes it possible to transfer LTPS-TFT circuits onto flexible substrates. « Saving, » has long been the key theme to Epson’s electronic device development with Epson products well known for their energy saving, space saving and resource saving. In the current project, Epson is aiming to build on its traditional strengths to firmly establish the field of flexible microelectronics technology. 3. Reduce electromagnetic radiation by 20dB. The current invention is the first time in the world for an operational 8-bit asynchronous microprocessor to be formed on a flexible substrate. Epson believes that technologies allowing flexibility will be of critical importance, as society becomes ever more familiar with ubiquitous and mobile devices. Epson’s forthcoming R&D into asynchronous microprocessors will concentrate on establishing this technology on a practical level, as well as searching for potential applications. *1: According to Epson research. *2: Surface Free Technology by Laser Ablation /Annealing. SUFTLA is a trademark or registered trademark of Seiko Epson Corp.